Me and Martin were in cinema yesterday. The most important thing of the evening was that we have bought the tickets in advance on the internet so we didn't have to be in cinema half an hour before the movie beginning. Smart funny, sentimental, action, bloody, rude and once more funny. The movie could be reccomend for pople who likes Pulp Fiction, Lucky Number Slevin, Hot Fuzz. The movie should not be reccomend for hard-core fans of Harry Potter because Fleur Delacour already won't be as she used to be for them. There are also Mad-Eye Moody and You-know-who in the movie but their characters are not as changed as the Fleur's is. PS: The main reason I write about this movie is that we are going to film premiere of Indiana Jones tomorrow. 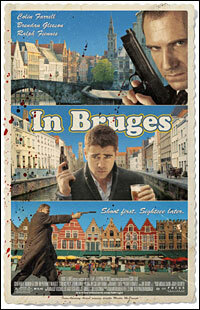 I like In Bruges movie and its poster but it will be changed tomorrow and I would like to have it on my blog still in the furture.